Glitzing up the house of steak is a treacherous undertaking -- lose sight of the essentials, and you're left with a shrine to despair. 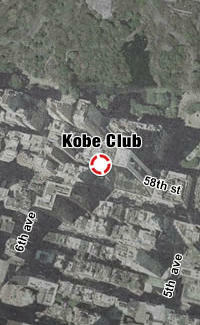 Opening Monday, Kobe Club's pushing atmospheric boundaries while maintaining its proteinaceous core. Designed by that guy who did Double Seven, Kobe's a high-end, New Jack steakhouse/lounge that looks equal parts speakeasy, LA rock den, and Japanese armory. The overall aesthetic's elegantly deadly, with a stingray-skin bar, chains draping the east wall, and 2000 samurai swords suspended point-down over the main dining area -- providing your meal a delicious, pre-impalement immediacy. But appearance aside, KC's menu is strong enough that they could festoon the ceiling with tampons and still maintain steakhouse cred. Some prime examples: Apps: The Crab Cake Double Stuffer: a pile of lump crab sandwiched by two crispy crab cakes where the bread'd usually be. If someone ever pulls off this concept with the hamburger, marry him. Steaks: Kobe and Kobe-style Wagyu, orderable in one juicy slab (e.g., the 28oz Australian Wagyu Porterhouse), or in a meat-flight of 4-6oz chunks. Sides: There are three whipped potato varieties, including sour cream/chive, wasabi/shiso, and lobster/black truffle, a.k.a., "Surf & Fungus". KC's also got a killer cocktail list, which they'll soon offer in punchbowl-sized servings you can ladle into glasses (or not ladle into glasses). In Jan, they're instituting late-night hours and breaking out classic board games (backgammon, Monopoly, Hungry Hungry Hippos, etc). If anyone insists that a true steakhouse wouldn't allow Monopoly, set down your pewter shoe and settle the issue with the overhead décor.